According to a report by the Irish Times, GreenMobility is expected to procure the electric cars from Renault. While not confirmed it is likely as GreenMobility already uses the Zoe electric car for its car-sharing offers in Oslo, Norway. Also at their home base in Copenhagen the service launched in June 2016 with strong support by Renault reportedly. GreenMobility has not released a launch date for the new electric car-sharing apart from saying it will be this year. The company claims to be in talks not only with Renault Ireland but other stakeholders in the city as well. In Oslo for example, they work with the national state transport company NBS. 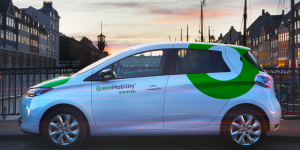 Apart from operating trains and buses the latter now run the GreenMobility car sharing as well. Over on the emerald isles, the Irish government published its national development plan almost a year ago. Project Ireland 2040 outlines the country’s move to a low carbon economy bolstered with 116 billion euros. They have earmarked 22 billion for climate protection measures, including electric transport initiatives such as charging infrastructure and electric vehicle incentives.